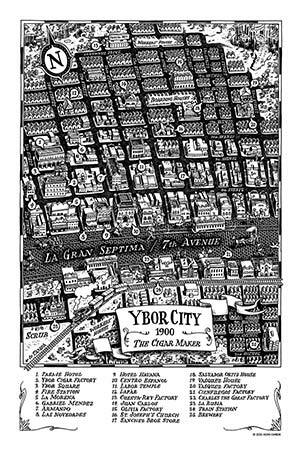 A few weeks ago I only knew of Ybor City as a reference in a Hold Steady song. Now I could probably do a decent job giving walking tours of the place. 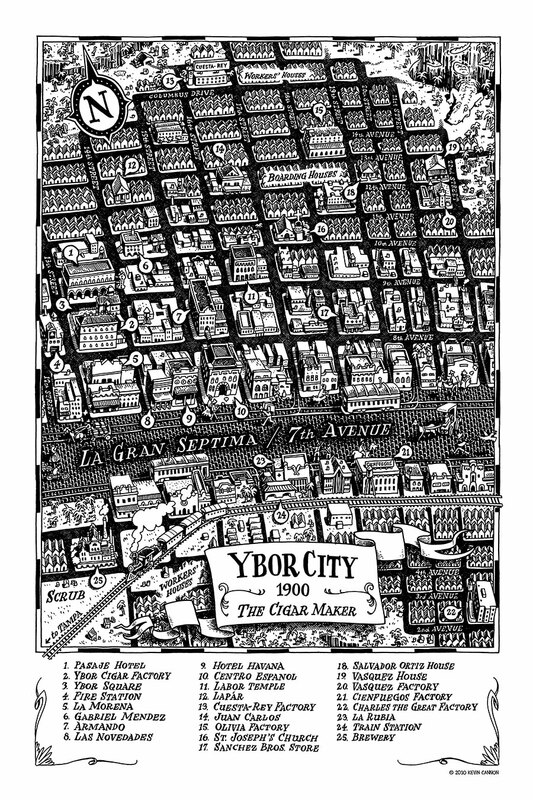 That's all thanks to local author Mark McGinty, who enlisted me to draw two maps for his upcoming Ybor City-based novel, The Cigar Maker. 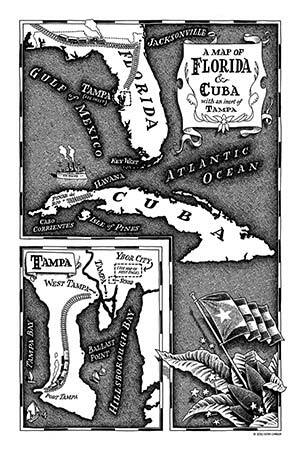 Mark blends fact and fiction to take an engaging look at the Ortiz family as they move from war-torn Cuba to newly founded Ybor. I had the pleasure of receiving an advance copy of the book, and in all honesty I couldn't put the thing down -- it runs at a fast clip, expertly blending pulp adventure with a thoughtful portrait of turn of the century Cuba and Florida. Keep an eye out for The Cigar Maker during Art-a-Whirl this spring, when Mark plans to release it to the public. In the meantime, you can read more about the novel (and even PREORDER it) at TheCigarMaker.net. And keep an eye out for the book's cover, which will be created by veteran cartoonist conspirator Lupi McGinty. 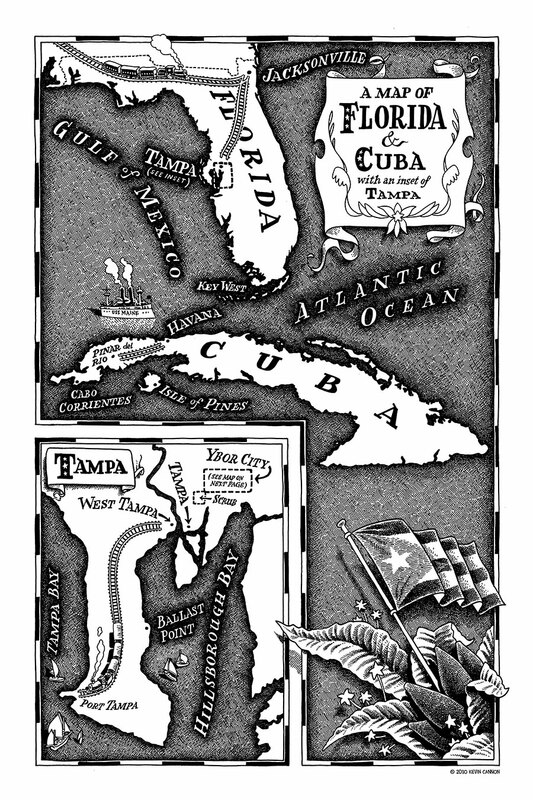 I love the shading on the leaves and flag on the FL/Cuba map. And having been to Ybor City, I really appreciate the architectural details on the little buildings. That will definitely add to the authenticity of the book. Super amazing maps; I also like the golf illustrations in the previous post but it looked lonely so I'm merging this comment into a comment about both posts. In conclusion, Kevin's art is hereby great. Thanks, Max, it's good to hear your e-voice!